I'll give you a quick summary. 1) Fix your technique. Playing the guitar shouldn't hurt. If people say you just need to get used to it. That's wrong. When your wrist or forearm starts to hurt, you're not playing right. What is proper technique? See the blog for excellent information. 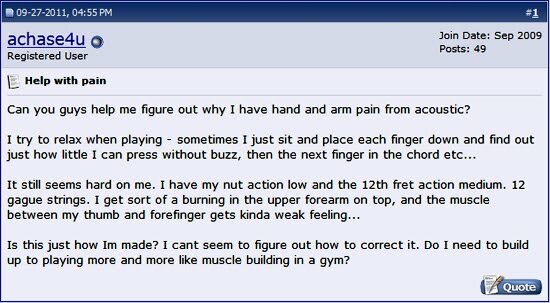 You should keep your muscles as relaxed as possible, I read you were making an effort to do so, but It's all in the technique. 2) If it hurt, cool with ice. Your body's natural reaction is to isolate the lets say 'over-used' parts. This can show itself in either, swellings (fluids around the tendons) or 'insulating' parts of the muscle with soft tissue (scar tissue). Well if this starts to happen, you are far from home. If your icing your body won't get a chance to isolate and you will have time to fix your guitar playing behavior before it's too late. 3) When you are not experiencing any pain (anymore) do your best to stretch your forearm muscles and make them more flexible. 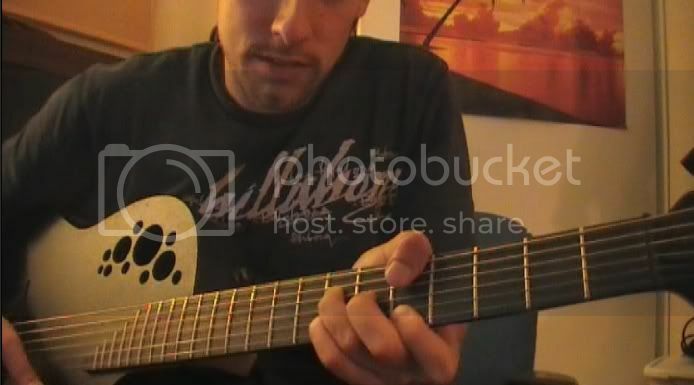 This will help a lot to get stress off your muscles when you put tension on them (play the guitar). I'd say check out the blog and ask your question, maybe shoot a bit of video of your playing technique as a reference. I'm Dutch so I might not be using all the proper terms but I think it's good enough to follow. Good luck make sure you fix it before it gets worse. Btw. Some people never have to worry about this, it's just in your genes. 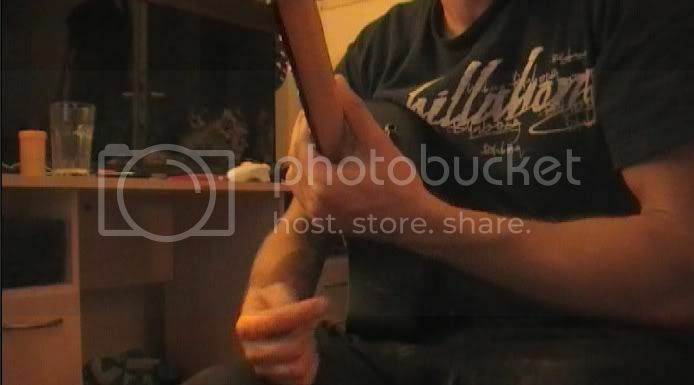 Some can play the guitar like a Master without worrying over their technique, but if you, like me, got 'weaker' wrists for whatever reason, you need to become very aware of your technique. I'm just gonna add some picture I took myself. And I want to ask you guys if you agree with me. Bad wrist position, lot's of stress on the forearm muscles. This is better, relaxed on forearm. Still have to put pressure on the strings. 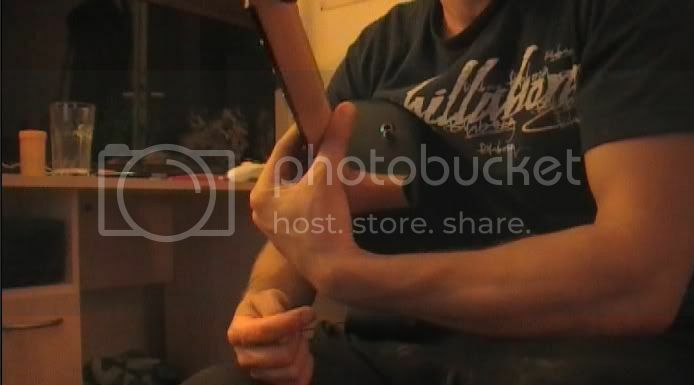 Since I already developed an injury, even this position will make my wrist hurt, and it's been two years since I stopped playing the guitar on an intense level. I now try to use my thumb for the bass strings. This way I'm using whole different muscles. It's just as if I'm grabbing a hold of the guitar. It's fun because a lot of chords are possible and sometimes you even got a spare finger for more possibilities. This is something I' want to get into. Since it might be just the right solution for me. Hmmm anything else you can suggest? I'm not playing an acoustic, but my hobby - chainmaille making involves a lot of repetitive work with the wrists and the thumbs and at one point they start hurting like hell, only option I have is taking a break for a while. Great advice mate, I´ll try to adapt this to my practice thanks. hm this sure is helpful! im a noob at playing, so i figured it was because im not use to it..thank you! Glad I found this. My friend plays the guitar and he constantly moans about his wrist. Always wears wristbands thinking they'll help him. @Shash You need your hands/ arms in the most relaxed position in which you can do the activity. Don't tighten your muscles when it's not necessarily. Take breaks that's good. And ice it when your wrists feel stressed. That's all the advice I can give. This is good advice. I know from experience that your suggestion will definitely work in protecting the wrist. Great tips, I'll be sure to keep this in mind. I always tell my students that if they experience pain in their wrists or shoulder to check their form immediately and take a break. Your pictures are good examples, I may show them to students as examples! ı used to do this mistake when I first started too. How to know whether you are suffering from tendinitis or not? I've been playing guitar since last 5 years but since last 2 days, my shoulders are starting to hurt. Woah! Interesting that I came across my old post on this site. Still trying to fix my arms. I actually have discovered partially why I have these issues - tension of course, must be eliminated always. But I also used to train Shotokan Karate for years - where we trained blocks like attacks. So we would blugeon each others inner and outer forearms near the wrists in training these blocks - and it has left me with damage there where I have my main issue - dequervains. I've stopped playing much - I dabble with piano and trumpet these days for some variety. Hoping that I can somehow go back to guitar. So far, even only a little playing will irritate my arms. There is one product SOME people have success with - the flextend glove. Check that out, too. These are the tips to escaped from getting hurt during acoustic playing. There is a lot to talk about in the bugera v22. In the next section, we will see all the details and specs. We will also see how these details and specs are implemented and how can they work for an average guitar player or music lover. the emulator that spends significant time on computer games. With MEmu you can appreciate numerous elite titles that you can discover for the Android stage, specifically on your PC. You don't have to alter any entangled settings and design the controls, simply introduce it and begin playing. , you can introduce Android recreations effortlessly, just tap the APK catch on the correct side of the interface, select the APK of the diversion you need to introduce and pause. It truly is that simple. Similarly, as with most emulators, the controls are as of now set up, so you can play any diversion with either the mouse or the console. With MEmu, however, on the off chance that you don't care for how the controls are arranged, you can simply change them, or even utilize an Xbox 360 controller on the off chance that you are more alright with support gaming. is a remarkable decision. It gives you access to a huge swath of amusements for Android, appropriate on your PC. The levels of similarity, customization, and document association are superior to a portion of the more outstanding choices available. GridinSoft Anti-Malware's full-framework examine is both quick and thorough. It orders a complete report subsequent to filtering your framework, and gives information on aggregate memory things, vault things and checked records, together with distinguished Trojan contaminations. The framework log subtle elements demonstrate the name, infection compose and focused on document way for each contaminated thing. Reports are consequently spared to a plain content archive. By and large, Gridinsoft Anti-Malware Crackis a compelling technique for assurance against different sorts of malware. That being stated, it demands an expansive number of framework assets and more seasoned working frameworks may wind up flimsy under the strain.15 day time for testing enables you to test the product. If it's not too much trouble know, that preliminary adaptation can discover dangers, yet can't evacuate them if there were in excess of two dangers found. You can never be totally protected on the present Internet, however, you can approach with the fitting devices. A decent security arrangement is Gridinsoft Anti-Malware download It is equipped for distinguishing an extensive variety of malware and it can counteract assist diseases. The program bolsters numerous examining modes and it gives continuous insurance to your framework. GridinSoft Anti-Malware is allowed to strive for 15 days, with some usefulness confinements. Downloading and introducing the program doesn't take long and there is no compelling reason to set up any essential instruments or administrations. It very well may be utilized on any famous Windows stage, without giving up an excessive number of assets. The program's capacities are perfectly sorted on a few tabs, on a cutting edge looking UI. You can discover its examining alternatives, the constant security switch, various devices, general choices, and different segments. Notwithstanding what you plan to do, you won't have any sort of troubles, because of the product's easy to use outline. GridinSoft Anti-Malware can perform snappy and full outputs, and custom sweeps, which you can go for particular organizers on your hard drive. Moreover, the product accompanies a committed filtering capacity for USB drives and other outer memory gadgets, which can enable you to square malware dangers when you module such gadgets. Other than evacuating and averting malware contaminations, the product can likewise reset program settings and refresh strategies. Besides, on the off chance that you think your PC is contaminated, yet the program didn't identify anything, you can let GridinSoft Gridinsoft Anti-Malware keydata about your framework and send it to the engineers for investigation. In the event that you wish to have the capacity to surf the web securely, at that point GridinSoft Anti-Malware is certainly worth having. Geniuses: The program underpins numerous examining modes. Additionally, it accompanies ongoing insurance capacities. It has a cutting-edge plan and its controls are anything but difficult to ace.